DrupalCon Munich was fantastic. It gave me a variety of experiences. I volunteered! I spoke! I attended meetings and schmoozed with cool people. I saw sessions! The open source universe is wide and wonderful. It's filled with people passionate about solving problems together. Communities, projects, foundations and associations. The Drupal Association is one organisation in this universe. It's an important part of the Drupalverse. It recently turned 6 years old, and it's about to lose its first tooth. This year I've been to Denver, Colorado and Portland, Oregon. Next week I'm heading off to Munich, Bavaria to speak at DrupalCon Munich. Later in the year I'll be heading to San Francisco for the final face to face board meeting of the Drupal Association for the year. That's me, Donna Benjamin, Drupal Association director at Large, international woman of mystery! Ok, perhaps not that mysterious. Perhaps I should explain? 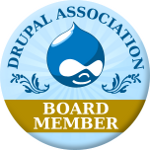 Late last year, the board of the Drupal Association put six things on the agenda for 2012. One of those was to coordinate Global Training Days to get more people to start learning Drupal and help address the world wide talent famine for skilled drupalistas. The next one is happening on Friday 22 June. That's this week. The dates for follow up Global Training Days are 14 September and 14 December. B ack in early February I got myself elected to the Drupal Association (DA) board. Last week, I attended my first board meeting in Denver at DrupalCon. It made me feel a whole lot better about this new role, because until then, I'd not really had a chance to do anything. Other than agree the DA should open a bank account in Europe so we can better deal with European currencies and events. If you want to vote in the Drupal Association election you have less than 10 hours left to do so! Playing about with Storify for the first time as a way of shaping the post event report for Drupal Downunder. It claims to have an export to Drupal site feature (or tumblr, or wordpress, or posterous or mailchimp) but I couldn't get that to work. Instead - I've used the embed code. On balance, I'd say Storify is a pretty nifty web app. This post is very long, mostly cos it has lots of pix, embedded vids of each of the the keynotes and is interspersed with tweets and other snippets about the conference. Hopefully, it gives a taste of the event and the fun that was had.